Rangitoto may be much older – and more explosive – than previously believed. A new study has led scientists to reassess how volcanoes may behave in the future and could be a large step toward unlocking Auckland’s mysterious volcanic past. Contrary to the long-held belief that Rangitoto was formed less than 700 years ago and has erupted only twice, University of Auckland researchers now suspect there may have been intermittent activity from between 1500 years ago to 500 years ago. Alongside basaltic ash from the island volcano’s most recent eruption between 500 and 550 years ago, sediment samples taken from Lake Pupuke have revealed evidence of minor eruptions 922 years ago, 1040 years ago and 1500 years ago. 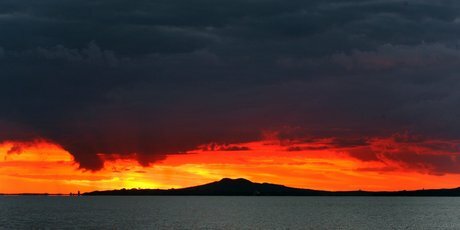 A new discovery that shows that Rangitoto erupted “semi-continuously” for about 1000 years is prompting scientists to re-think what the volcano could do in the future. The most recent volcano to erupt in Auckland, Rangitoto was thought to be close to 550-years-old and to have erupted once or twice in its lifetime. However, new University of Auckland research shows that the volcano actually erupted “intermittently” or “semi-continuously” from about 1500 years to 500 years ago, smashing traditionally-held beliefs about volcanoes here and around the globe. The findings are also prompting scientists to re-think how Auckland’s volcanoes will behave in the future. “The old paradigm was that these volcanoes erupt suddenly in a new location each time, and only live for months to a year or two,” said lead researcher Associate Professor Phil Shane.